Like Kiss without the face makeup and pyrotechnics. On the road without Kerouac. That's me. Like Springsteen without Clarence, Little Stevie and triple encores. On tour like The Who, without groupies and guitar smashing. Like Woodstock, without the mud, VW buses and Joe Cocker. Like the Grateful dead, without beach balls, Jerry Garcia solos and the stoned naked guy running around. It was like all of that and way more. It was a GREAT day. Perhaps I should clarify and say it was a GREAT afternoon. Because the morning was so incredibly underwhelming I can hardly describe it. The morning event at Threshold Inc. was an "Author Showcase". Twenty authors were there signing books to no one but themselves, apparently. I managed to sell four books, three of them to friends who showed up. A couple of authors wanted to trade books, which is fairly assumptive if you ask me. Talk about feeling obligated. I did kinda enjoy speaking with the paranormal author with the fedora and neck beard. He's writing a book about GoatMan, a creature who's half man/half goat. He's not sure if it's real or not, but many people have eye-witness accounts, supposedly. GoatMan, Flesh or Folklore was the title. You meet all kinds in this business. So GoatMan guy had to be the highlight of the day. On one side of me was a former Doctor selling a book on his cure for tendinitis. The book was $45, and I think he might have sold one. On the other side was a woman who had a series of 6 self-published books, who also sold one and gave away six dollars worth of swag. It was one of the bigger non-event events that I've ever taken part in. But the GoatMan guy was cool. Needless to say, I will not be participating next year. The Cafe De Arts event on the other hand was SPECTACULAR! By the time I was introduced by Kathie Giorgio, director of AllWriters' Workshop and Workplace, the place was packed. Standing room only. After I signed a few books, Kathie gave one of the most flattering introductions I've ever had. She described my first experience with coming to AllWriters' and then went on to lay out some of my accomplishments over the years. I am never comfortable in the spotlight, so hearing this made me squirm a bit. At the same time, I was so grateful for the complimentary way she went about it. She is an amazing instructor and helps her students succeed in any way she can. When she was finished I gave my thanks to all who helped me get the book to where it is today. Then I did readings from three different spots in the book, one on the Malibu car, one on portaging and one on toileting in the BWCA. I always dread standing in front of a crowd, but I always seem to do okay, so I think I need to get over it. When I was done reading came the fun part. I got to talk to and sign books for many, many good friends. Old friends and new. People that helped me get here and people who just are happy to see me achieve something I worked so hard for. I've said it before but having a book published is right up there after my marriage to Donna, the birth of my two kids and a job in GIS that I love. I realize it is an overused term these days, but I am brutally aware that I am a blessed man. And I thank each and every one of you for being a part of my story. Hopefully this is the start of many books, and if it is, I look forward to doing it with you all again someday. 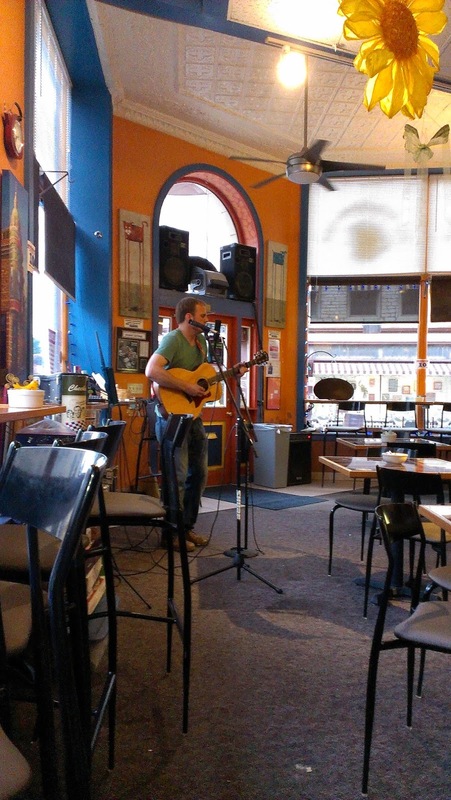 On a side note, the day was finished off at the Steaming Cup where my friend Nick Konkle (aka SnowCap Weber) played a gig from 7-9. He was excellent as always; Like Neil Young without Crazy Horse. Check out his CD, Flowers. It's great. It was a perfect ending to a great afternoon. By any chance was the second event, where Kathy introduced you, taped?? I'd love to hear her introduction, even though it made you squirm a bit!! So proud of you, so happy for you!! I wouldn't call it a neck beard. That turned out to be a good event for me. I think I sold at least a dozen books. Goatman: Flesh or Folklore? was just featured in Rue Morgue magazine. Glad you considered me a highlight. Hope things are going well for your book promotion.